A 3D printed adapter ring is a good solution for fitting two different sized plastic pipes together. Design it well and you get a snug fit that should last. When we moved into our current house, we discovered that the basement bathroom did not have a proper vent to outside. The bathroom fan just blew exhaust into the furnace room. Not good. 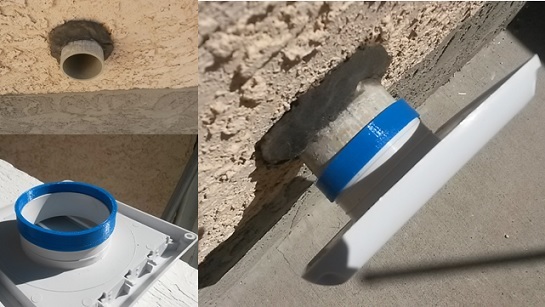 So, my brother in law Martin was kind enough to install an exterior vent pipe. Unfortunately, it has proven impossible to find a vent hood that fits properly over the exhaust pipe. We forgot to choose a pipe that was sized to fit typical vent hoods. Also, I wanted a louvered hood that would close when not in use. So, over the years I have just used duct tape to hold the hood in place. This never really worked well or lasted any length of time. So, it occurred to me that I could 3D print a plastic adapter ring to mate the hood to the exhaust pipe. What I needed was an adapter ring that would compensate for a 4 mm difference in diameters. My Sunhokey 3D printer was up to the task. It took a few hours of measurement, design and printing. And, as you can see in the pictures above, everything fits like a charm. I wanted a snug fit and that was the result. Hopefully, no more duct tape and constant repairs.